Wow.. great texture and lighting. well seen and done. bravo. Hey I like it - reminds me of myself (i.e. a solitary nut). Great detail as well, top notch! great detail and focus. don't feel the red border adds to the shot, though i assume you are using it to emphasie the red in the image. perhaps a thinner border. slightly overcropped on the bottom. Bet you can only eat just one. :) You set up this image quite well. Good macro shot with good composition and focus, although I personally think unsalted peanuts are more photogenic. 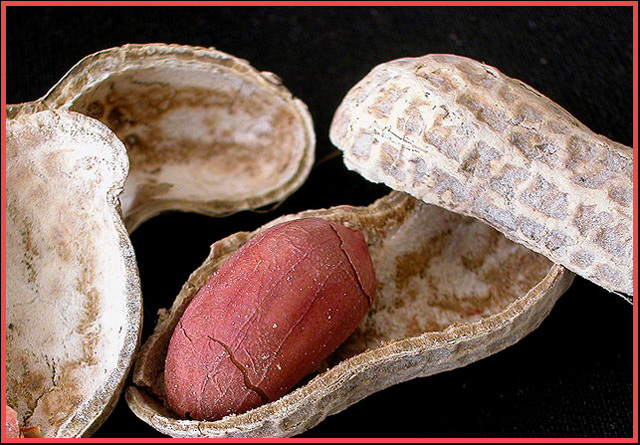 But although the peanut is certainly alone, I just don't get a feeling of loneliness or solitude. I want to eat the nut and go search for another bag. I don't care for this border with this shot at all. Nice lighting, contrast and detail. Cute concept. Good idea, nice tight macro shot. I don't like this border, it's distracting and add nothing to the exellent picture. 9. Proudly hosted by Sargasso Networks. Current Server Time: 04/21/2019 02:09:46 AM EDT.